Calm. Raindrops on my face in the darkness. I flip down the lid on the bivy and go back to sleep. Sleep. More rain, heavier and with strong gusts. The cold front arrives. A blustery morning. A double reef tucked in the main and the sail wrapped tight to the boom and gaff. I tie the jib down to the bow sprit using a "shoelace" knot with a long line that runs back to the cockpit. I can just walk forward and tug the line to free the sail. The mizzen sits in the lazy jacks ready to raise. Anchor up and motoring through the mooring field at 7:35. I think about staying on the creek, waiting out the front, but keep going. 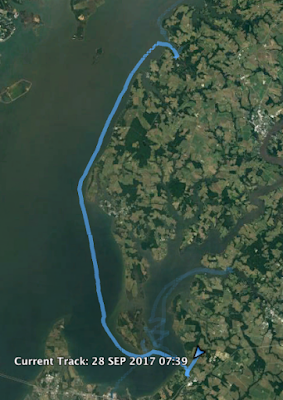 The entrance channel faces to the northwest, a strong northwest wind blows right into the channel. Waves in batches of three roll off the Bay. I increase the throttle to push out through the waves. After a set comes through I raise the mizzen which helps me keep Spartina pointed directly into the wind. Full throttle and the bow reaches up with each wave and drops back down with a splash. I think about turning back. I look to port and there is a man in the cockpit of a 36' sailboat and he is watching me, probably wondering what I am doing in this weather. Spartina seems to inch forward while I watch the point to the southwest. Thirty minutes under power at nearly full throttle and I begin to worry about the fuel. 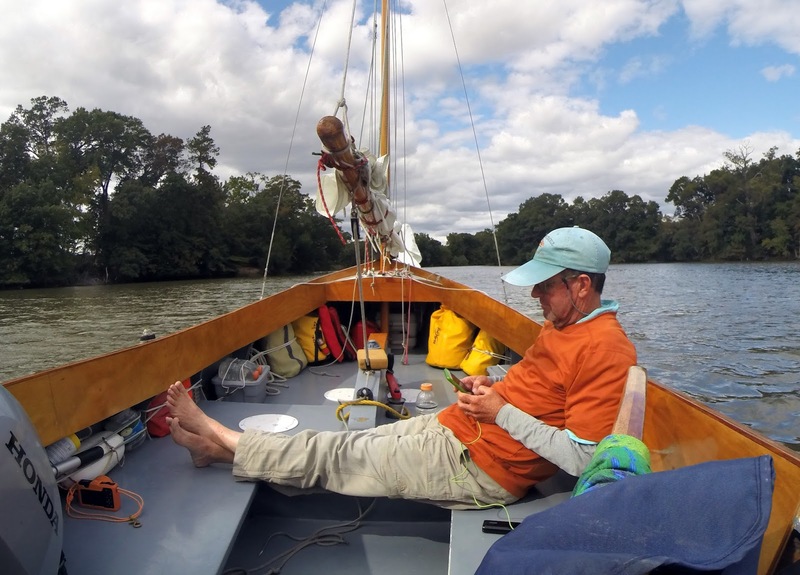 I look to the point and see we are clear, cut the power, raise the outboard, walk forward to tug the line freeing the jib, raise the jib and....we are sailing. 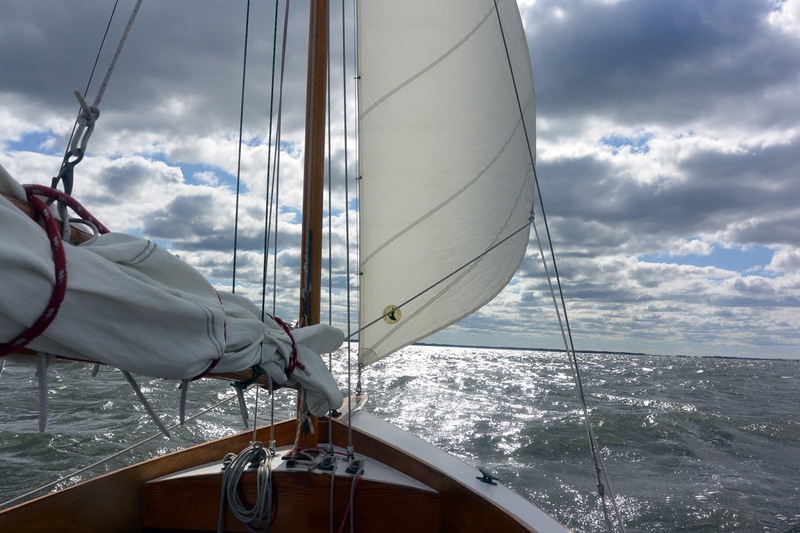 Fairlee Creek is just to the south, my bail out point if I find it is too rough but under mizzen and jib the wind is perfect. Making 5.4 knots and I know it will be a good run south. The spray flies as waves come up on the starboard quarter to slap the hull. 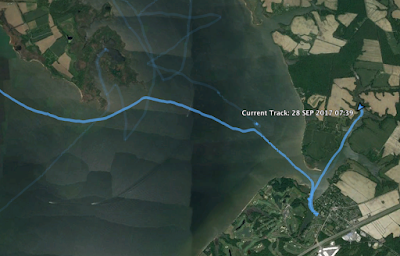 Spartina heels steadily in the wind, 6.6 knots and then 7.1 sliding down the face of the waves. Past Tolchester at 8:50, cut across the the shipping channel where it comes close to the beach with a tug and a tow about a mile to the south. The Eastern Shore flies by. 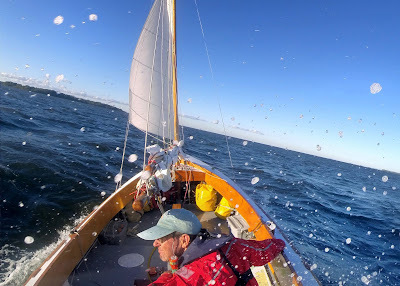 Swan Point at 9:20, 5.6 knots in calmer water. An old Chesapeake Bay buy boat power past us headed north with a rough ride in her future. Low white clouds move in and the air quickly chills. 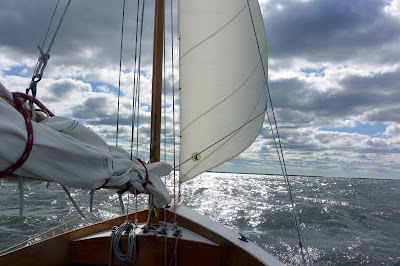 It is a quick ride alongside Eastern Neck, the wind seemingly on our beam and I wonder if I can make the turn at Cedar Point to sail up the Chester River in the lee of the land. 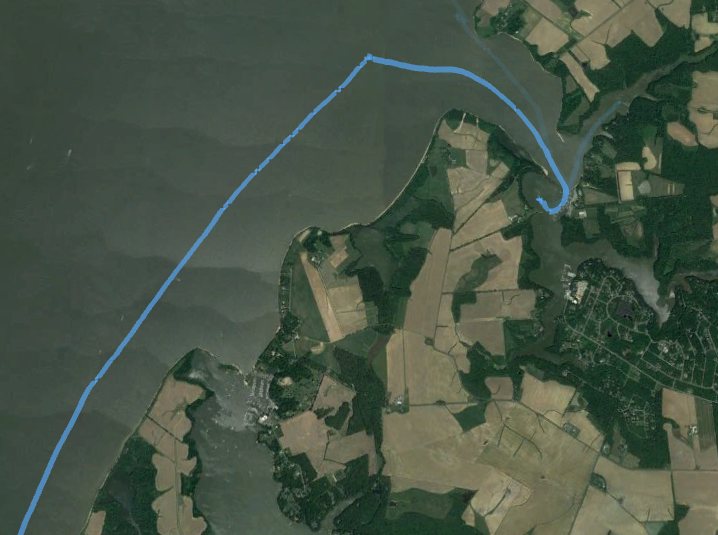 Cedar Point at 11:30, I'm sailing too close to shore and dodge out to get around a fish weir. We round the point to calmer water, 4.2. Passing Hail Point I look up the Chester and see nothing but white caps the length and breadth of the river. Not going up the river after all. I pull the tiller to port, finding the waypoint for Queenstown Creek on the GPS. 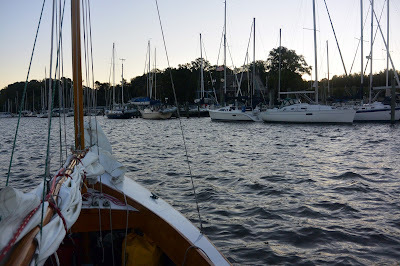 We sail almost directly downwind into the shallow entrance to the creek, big waves rolling up under Spartina's stern. Inside the creek we round up to drop anchor and catch a breath. I use the map on my phone to locate the town dock and also find a pizza place just a few blocks away. I order the small Philly cheese steak and fries. When I see the size of the sandwich I think he must have brought me the large but no, he assures me it is the smaller version. I won't need dinner tonight. It's an enjoyable meal, I take my time in the little pizza joint in a nice little town. Walking back to Spartina I check my phone to see an unexpected text message. It's Michael and Sheila, my cruising friends aboard the ketch Kantala. Last I had seen them it was summer as they set off across the Atlantic to England. Last I had heard of them they put into Nova Scotia to repair the steering vane. 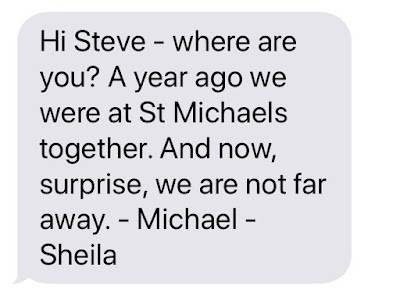 Great to hear from them but why were they back on the Bay? 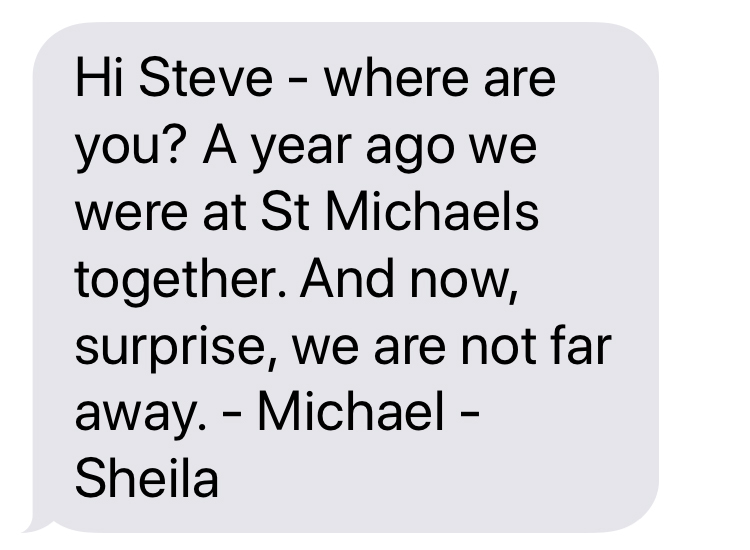 Hello Steve, thanks for the post. Last summer I found that running with the wind aft of the beam a Vang for the mizzen sail becomes necessary. 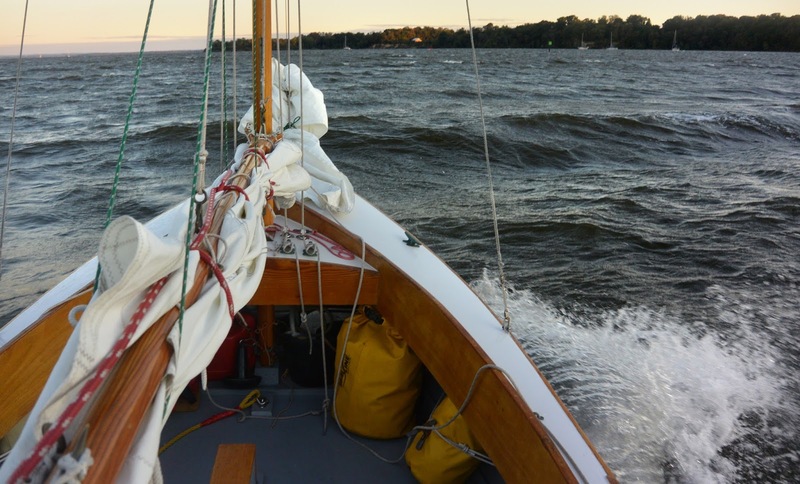 I found myself a few times with the mizzen boom shooting up and getting in a mess when gybing in strong winds. Have you experienced the same?